Notes: K9 Kodak was part of a group of dogs which responded to a terrorist attack on Aptil 18, 1995 in Oklahoma City. This event was the first time a VSRDA K9 was used in a terrorist attack. 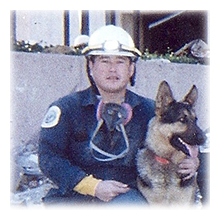 In addition, this was the first group of canines that were used in Urban search and rescue (USAR) task force systems. Kodak was one of the first 50 canines to go through the initial program. 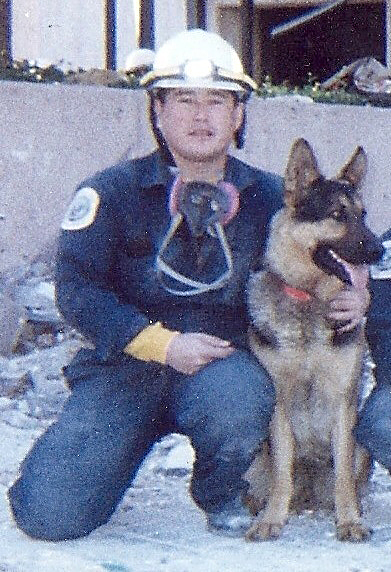 Don Casias & K9 Kodak, with a group of responders, kneeling in front of the Murray Building in Oklahoma City on 18 April 1995, after the building was bombed in a terrorist attack.